The keyword in both of these definitions is "intensive" which is a characteristic common to many gardening experiences we undertake. More often than not gardeners plant several or many plants in their garden to provide a supply of home-grown food. They may use special fertilizers and tools to grow and manage the plants they've started. Gardening is not a laid-back activity... it's intense! 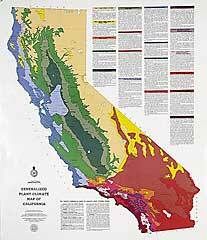 California horticulture is marked by its diversity and complexity. Given California's remarkable geography stretching from the sub-tropical south to the alpine north and the ocean's coast to the Sierra Nevada peaks, just about every kind of plant can be grown in California. Plants around the world are distributed in response to many environmental variables, in particular, temperature. In the United States and in California temperature hardiness Climate Zones have been defined based on normally expected high and low temperatures. Of 24 climate zones defined in the Sunset Western Garden Book and the 20 zones defined by the United States Department of Agriculture, California has 20 and 16, respectively. This wide range of temperatures in combination with the state's diverse soils and rainfall distribution patterns (wet winters and dry summers of a Mediterranean Climate) results in an outdoor environment that's well-suited to almost all horticultural activities. The bottom line is that there is nowhere else on earth like California when it comes to horticultural diversity and opportunity. Today, California horticulture is in transition. Gardeners are becoming more interested in the use of native plants, organic fertilizers, and natural ways of combating pests. Taken together, the term "sustainable horticulture" is being used to describe horticultural practices that are least likely to adversely impact the environment. Gardeners are looking for ways to improve their soil and use less water so they can effectively grow the plants they love. This web site will provide all the resources and information needed to maximize the enjoyment from gardening in California. Our gratitude to Dave Burger, UC AES Professor & Horticulturist, for writing this section of the California Gardening web site.